The 'Don't Wanna Go Home' hitmaker has revealed his plans to have a stab at Hollywood after he releases his first album since 2015's 'Everything Is 4', as he's always had a passion for movies ever since he studied theatre at college. And he already has some experience on his CV having previously had guest appearances in TV's 'Lethal Weapon' and 'Empire'. Revealing his plans to take time out and act, he said: "I definitely want to do more - it's just finding time as doing a movie that's four months of my time without doing shows and making music. "This is something I have wanted to do for a long time but I always end up getting the music bug but I do really want to take the time out and do some serious acting. "It's something I have always been into and I actually did acting at college, I went to musical theatre college." The 27-year-old singer - who has spawned hits including 'Talk Dirty', 'The Other Side' and 'Wiggle' - is currently putting the finishing touches to his first studio LP in two years and has teased there are a number of "unexpected" duets on there, which came together at his own studio. According to the Daily Star newspaper, he said: "I'm finishing up the album now, I have some really great stuff I'm excited to share. The album is coming very soon, there's some really dope, unexpected collaborations coming. "I have really enjoyed this album, it is the first album that I have done within my own space, and it's just been an incredible process. "When I'm inviting these artists to come to the studio I am inviting them to come to my compound and it has been a dope experience." 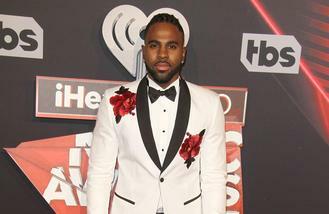 Derulo has already released his collaboration with Nicki Minaj and Ty Dolla $ign, 'Swalla' and It's likely that one of the collaborators on his new album could be Scottish DJ Calvin Harris as he previously revealed the pair were keen to work on music together once they can find some time in their busy schedules. Jason previously said: "We've been in contact and Calvin and I are interested in working together for sure.